Lars and Lukas Meindl are the 9th generation of the Meindl family to run this long-established, family-owned company. 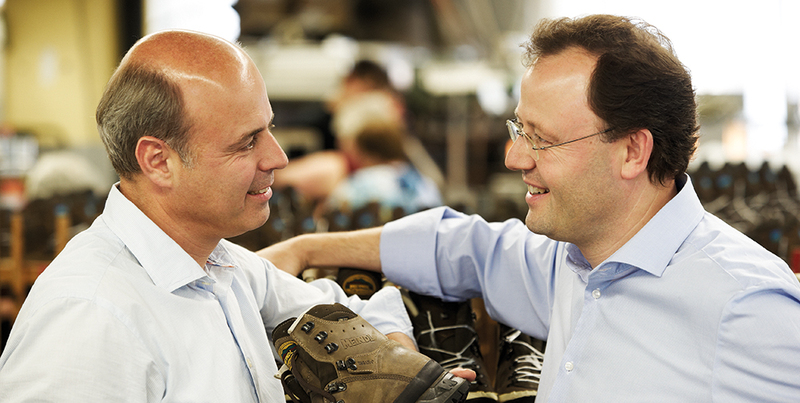 In an interview, they offer insights into the company’s philosophy and ethos of Meindl, a traditional shoemaking company. You brothers are now the 9th generation of the family to run your company. Coming from so much tradition and history, how do you manage to constantly adapt to market conditions and keep an eye on the future? Lars Meindl: That’s a very complex question. One the one hand, we stand by our traditions because they are part of our history and they make us what we are. We still make mountaineering boots using a traditional double-stitching method, for example. It’s a craft, and every one of our boots is unique. We are also fiercely loyal to our base in Kirchanschöring, and we are investing in its future. This sends out an important message both to our region and most importantly to our employees, who can depend on us. Lukas Meindl: And yet Meindl is also known for its innovations on the outdoor boot market. The foundations for this were laid by our father, Alfons Meindl, when we were very young. From the moment that we were able to think for ourselves, we would spend Saturdays with him in the workshop, helping to come up with new developments. While we were still small, it was still just playing and tinkering with leather materials for Lars and I, and over time this grew into development work. So you grew up in the company? Lukas Meindl: Yes, and not just on Saturdays, as I just mentioned. We also spent a lot of time in the company during the week, and drove everyone mad. I still remember the den we built in the leather store. Do you, Lars? Lars Meindl: Oh yes. We didn’t half make a mess! And the staff had to clear it all up again. I get the feeling they weren’t always particularly pleased to see us (laughs). But that’s how we got to explore all of the departments and areas of the business through play, and that’s how we grew up with the company. Do you divide the tasks and responsibilities between you? Lukas Meindl: Yes. Lars is responsible for the commercial sector, while I’m in charge of production and development. Lars Meindl: Of course, we coordinate with each other a lot and so we make decisions together. We find it great that we’re able to share the responsibility for our family’s company across both of our shoulders. On the market, mention is often made of the legendary “Meindl quality”. What’s the secret to that? Lukas Meindl: A statement like that doesn’t come about overnight. It evolves over years and decades, when customers are happy with products and then recommend to others. One of the key values that we live by in our company is manufacturing boots that are of high quality and which last. This is very important for the development of a boot, and starts with the materials. It continues with the way we make the boots using skilled workers and culminates in the service we offer at Meindl. Lars Meindl: It also quite simply has something to do with our name. Every boot we produce does, after all, bear the Meindl family name which has developed into a brand over the years. So in this situation, you want to offer quality. Added to this is the fact that we wear the boots we make ourselves. And both Lukas and I only want good-quality boots on our feet – boots that fit and that last. So do you try your boots out yourselves? Lars Meindl: Of course. Both in everyday situations and in the mountains. Our passion for nature and the montains was instilled into us by our father from a very early age. Lukas Meindl: If we wear our boots ourselves, we notice exactly where we need to improve things a little. On our trips, we’re always coming up with new ideas, so we create more and more innovations. Our testing team, made up of professional montain guides, is very important too, however. This team goes up and down mountains day in, day out and gives us excellent information which we then put into pracitce. Maintaining tradition is another value that’s important to Meindl too, isn’t it? Lukas Meindl: That’s correct. Our history is important to us. We continue to use traditional manufacturing methods, such as double-stitching. We are preserving this production method, and there are not many companies who can manufacture these types of boots. Lars Meindl: But maintaining traditions goes further. There has been an uninterrupted series of Meindl master shoemakers at our site in Kirchanschöring for over 300 years, and so we are deeply rooted in the town and our region. And we remain true to our roots. So the site in Kirchanschöring is part of Meindl’s awareness of its traditions. How should we interpret that? Lars Meindl: We are linked to the location and to all of the employees who work for us, and who have done so in some cases for generations. At the end of 2015, we completed our new logistics centre in Kirchanschöring. From here, we ship our boots to our retail partners all over the world. And one thing is for sure. There are locations that are much better and more central for logistics. Lukas Meindl: The next step is the redesign of our entire administration side, in order to offer our employees here a modern infrastructure. However we also want to continue the ongoing modernisation of our production facilities in Kirchanschöring. Sustainability is the in-word these days. What does it mean for Meindl? Lukas Meindl: For us, the emphasis has always been on creating a high-quality and long-lasting product. We have always taken great care to protect resources when making our boots. The fact that these processes are constantly being improved and developed is something that we see as perfectly natural, and we implement these developments all the time. Lars Meindl: With the explansion of our logistics facility in Kirchanschöring, all of our heat supplies were also switched over to regional fuels based on wood chips. What’s important for us too, however, is that we raise awareness amongst our employees. An excellent example of a regional approach and sustainability is Meindl Identity®. Lars Meindl: Yes, that’s correct. Our Meindl Identity® range is perfect for us. We are the only shoemakers in the world to be able to provide a detailed proof of origin for the upper leather we use. Lukas Meindl: And it comes from organic cattle from our region. Especially at a time when the subject of leather origin is becoming increasingly important for many consumers, we have the perfect answer to this demand with Meindl Identity®. To find Identity®, take a look on the Internet at www.identity-leder.de. Let’s stay with the subject of regionalism. You’ve set up a foundation that offers help to your region, haven’t you? Lukas Meindl: With our Alfons Meindl Social Foundation, we have set ourselves the task of supporting people in our region who are in unfortunate circumstances through no fault of their own. Lars Meindl: We are aware of our social responsibility, but we don’t want to make a big song and dance about it – we’d rather help people in our home town quickly and without any fuss. There are people who have worked at Meindl for many years. Are you proud of that? Lars Meindl: Staff who have been with us for many years and low turnover rates show us that many of our employees fell happy with us. Even if Lukas and I aren’t always the easiest people to have around (laughs). Lukas Meindl: Every year, we honour employees who have been with the company for 20, 30, 40 or 45 years. I always find every accasion to be hugely awe-inspiring. In the production area, we have some employees who are now the second generation of their family to work for Meindl, and who have learnt their craft from their parents. The concept of quality is therefore something that has not only been passed on to Lars and me. Meindl doesn’t just stand for tradition and quality. Meindl also means innovation, and you’ve already won many awards for this. How important is this for you? Lukas Meindl: We are delighted by every award that we win for our innovations. They demonstrate that the ideas we develop and implement with our team are able to impress. To achieve this, we need a team that offers experience and passion and one on which the technicians and users work closely together. Lars Meindl: Perhaps it’s also important that we focus exclusively on boots and have always remained a specialist. In any case, our awards inspire us to carry on what we’re doing and become even better. For our trading partners, awards are also a great help when it comes to boosting sales.